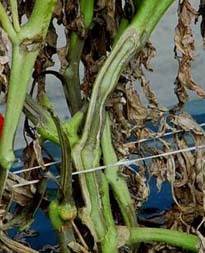 In tomato, bacterial wilt first appears as flaccidity in the younger leaves. 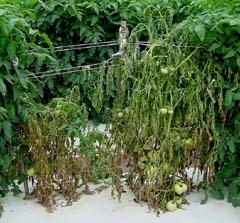 Under ideal environmental conditions, a complete and rapid wilt develops with advanced stages appearing within two to three days and plant death soon following. If environmental conditions are not optimal and the disease develops slowly, leaf epinasty may occur, and adventitious roots may appear on the stem. When sectioned, the stem vascular system initially appears yellow or light brown. As the disease progresses, the stem becomes a darker brown, and eventually the pith and cortex become brown. Water-soaked lesions may appear on the stem in the event of massive invasion of the cortex (5, 6). showing the browning vascular system. 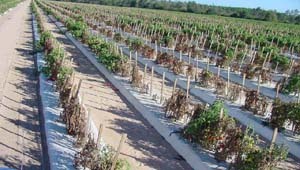 Tomato field in Florida with widespread incidence of bacterial wilt.